We’ve made go-karts since 1962. 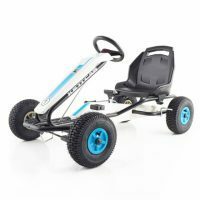 Yet, there’s nothing old-school about our newest go-kart models. With their dashing racing stripes and easy to reach pedals, summer days will be filled with laughter and joy as young drivers speed about. 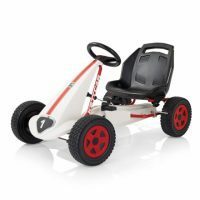 KETTLER go karts are perfect for children age 3 to 10 years. Here at KETTLER, we’ve been making high-quality kids go karts for more than 50 years. Since the iconic Kettcar first rolled off the production line in 1962, we’ve sold 15 million go-karts worldwide. Safety has always been a top priority. 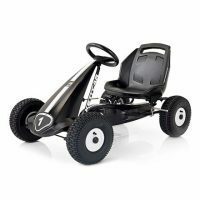 While our children’s go karts may look like race cars, they’ve been designed with easy to reach pedals, freewheel facilities, simple handbrake control, and adjustable seats. 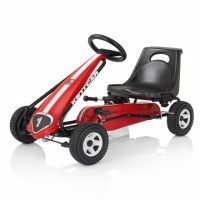 KETTLER go karts have been tested to the highest standard to ensure young drivers stay safe as they cruise around the garden. Go karting is made even more enjoyable by the range of vibrant colours on our models and all-terrain air tyres, so young racers can practice for the world’s best tracks. Speed demons will love zooming around in the super-fast Kettler Suzuka Air, with its funky orange and black design, and budding race drivers can challenge others in the sleek, black Daytona Air. With the wind in their hair, kids of all ages will love going as fast as their legs can pedal them.